The Legionella Management training course explains the background to Legionella, the potential risks associated with water systems and how these can be prevented or controlled. Why Do You Need Legionella Management Training? (c) measures to be taken to ensure tha controls remain effective, and their significance." "Inadequate management, lack of training and poor communication have all been identified as contributory factors in outbreaks of Legionnaires’ disease. It is therefore important that those people involved in assessing risk and applying precautions are competent, trained and aware of their responsibilities." "Those who are appointed to carry out the control measures and strategies should be suitably informed, instructed and trained and their suitability assessed. They should be properly trained to a standard which ensures that tasks are carried out in a safe, technically competent manner. Regular refresher training should be given and records of all initial and refresher training need to be maintained." Our online Legionella Management Training course is constructed in such a way that the questions are introduced after each module and an opportunity is provided to re visit sections of the module before answers are finalised. The course is presented so that the stimulus effect of the video content is combined with the physical video presence of the tutor that effectively provides one on one tutoring of the subject matter. Live pictures, animated graphics and the personality of the presenter form part of a very effective virtual learning environment. The online course allows progress to the next module when a pre determined pass rate has been achieved. In the event of the user failing to reach the pre determined pass rate the user is recycled through the content. 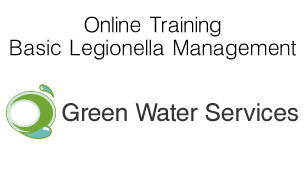 Please contact us for more information regarding our legionella management training service. We are located in Leeds, Croydon, Swadlincote and Burton-on-Trent, however our services are offered nationwide. Our online legionella management training course helps you to understand the risk that Legionella poses and helps you develop the systems and working practices you need to stay ahead.